LADY LINDA ♡ Exploring the lovelies and blessings of life! 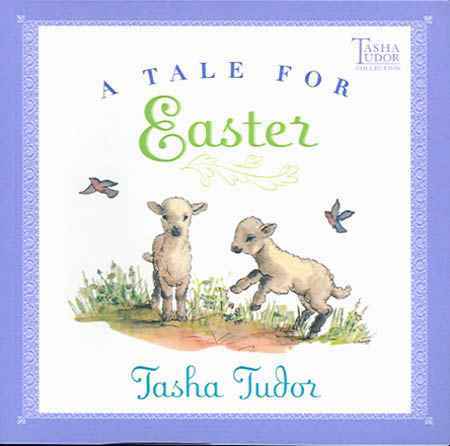 Welcome to the first day of MARCH and to my Tasha Tudor First Friday book review. Easter is so early this year-March 31st-so I thought I had better get this review in now or I would miss the season! A Tale for Easter was first published in 1941 by the Oxford University Press, London by the same company who published the first 3 books written by Tasha. The editor was still Eunice Blake. 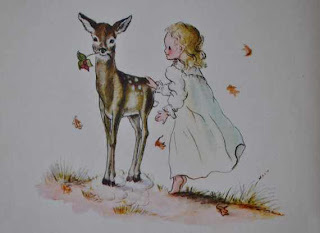 It was a bit larger book that her first three books which are also referred to as the Sylvie (her little niece) books. In my information, it was noted that this book was written when Tasha was quite young and living in Connecticut. The traditions, customs and weather were a bit different from her time in Vermont. Interesting and something I may not have thought about. The book is 32 pages long. The book was reprinted by Simon and Schuster in 1977 and is 6 3/4" x 6 3/4". March is coming in here in Oregon like a "lamb" so the new cover on the reprint is perfect! Several changes were made when the book was redone. The original book was written in calligraphy and that was changed to a regular print. The pages were changed around a bit. Some of the colors in the later edition are more colorful. So, what is this little sweet story about? 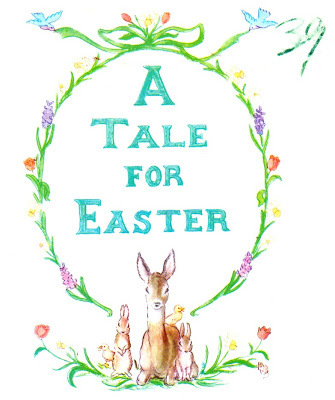 It's described as a spring story, told in the second person narrative. It's very old fashioned, with period dresses and items pictured. The little miss goes to sleep on Easter eve and has several dreams that take her with the young fawn past animals and daffodils and other Easter time treats. She wakes up to find decorated eggs in her bonnet and a magical surprise with her Easter morning breakfast on the table. I won't spoil the surprise. 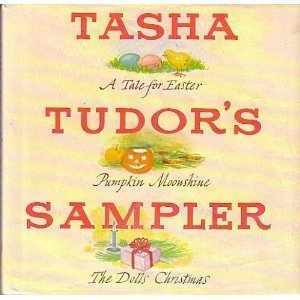 In 1977, the Tasha Tudor Sampler was published by the David McKay Company of New York. It features three of Tasha's books and they are all very special stories. As you can see from the cover, the text is done in calligraphy. but if you are interested in the Easter tree, be sure and read through this one. The book is one of my favorites as I love the holidays. Jim won several bids at an Estate sale last weekend and picked up the goods yesterday. Look what was in one of the boxes! The sweetest little Sunbonnet Sue teacup~just in time for TEA TIME THURSDAY! It didn't have a saucer, but there were two little sweet plates in the china. They are hand painted too and signed 1931 on the back. I think they are cute. Being a quilter, I love Sunbonnet Sue. 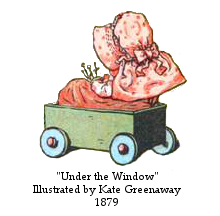 I decided to look up some history on this little miss and found out some very interesting information. Remember my full moon image from Monday? 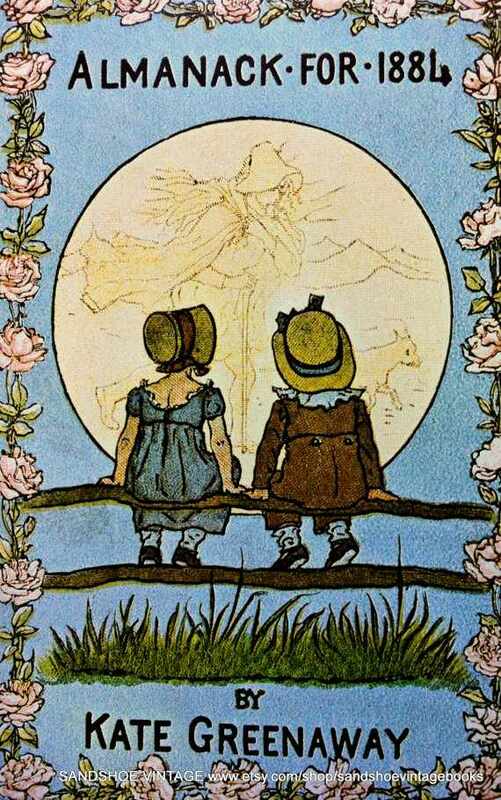 It was by Kate Greenaway. I was so surprised to learn that Kate Greenaway was the first illustrator to use a Sunbonnet Sue. 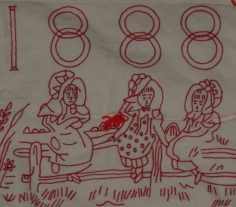 Embroidery and redwork was popular during her time, and you often see little ladies with bonnets. Crazy quilts were also popular then and you may see bonnets and ladies with bonnets in some of the embroidery work on them. 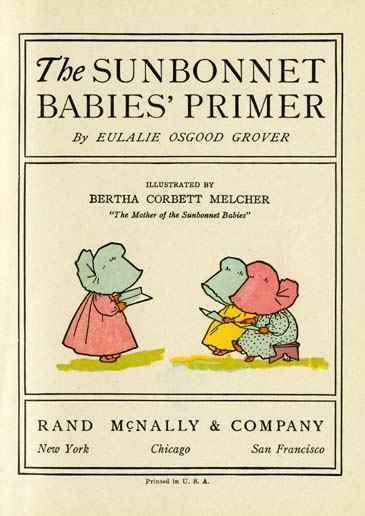 In the early 1900's, Eulalie Osgood Grover wrote several children's books-children's primers. 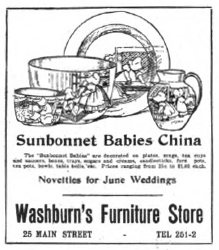 She had Bertha Corbett Melcher illustrate her work and she has been called the "mother of Sunbonnet Sue". 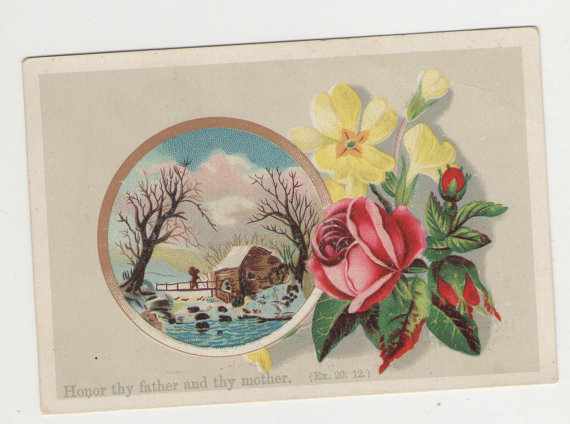 This is also an example of Bertha's work. She did postcards and also designed the graphics for the Dutch cleanser cleaning powder. I like the redwork design for this one too. Just too cute. Wouldn't you love to have a set of this children's china? I haven't ever seen any of this, but I sure would love to just see it. Note the advertisement...."Novelties for June Weddings"! 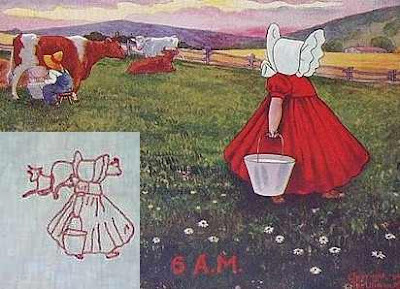 Quilt patterns also appeared for Sunbonnet Sue. The pattern may also be called Bonnie Bonnet, Dutch Doll and Sunbonnet Babies. You will notice a little boy in this vintage quilt. His name is Overall Bill, Overall Sam or Farmer Sam. You may remember one of my posts from last summer. These are some vintage Sunflower Sue blocks that I hope to finish----someday! Isn't this a cute little wall quilt? My friend Peggy spotted it at a garage sale a few years ago at the beach when we were at a quilt retreat. Yes, I had to buy it for $5! Cut idea. This is a little painting that we have in our bedroom. Jim is a fisherman so I had to have this one! Pretty serious fishing going on here! This is an item that I found and have listed on my Etsy. It used to have a pillow form in it. I like the corners. I love the quilts that were done in the 30's and 40's. My friend Ina has one that was made with feed sacks and you can read some of the print from the company. 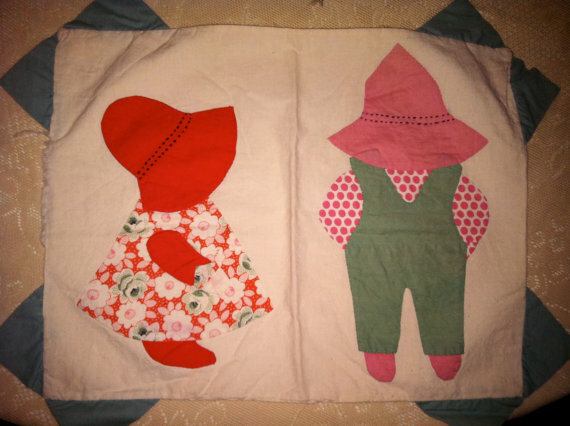 I am the first quilter in my family so I am not lucky enough to own any vintage quilts. Do you have any that have been passed down in your family? My mom has been gone for over 15 years and dad now lives in a retirement center that is really nice. I just got home from spending the day with him. Life is just busy and it's hard to take the time to go over to be with him...or so I think! He is so easy to be with and such a sweetheart. I ALWAYS have a wonderful time and I get the blessing. Today I patched up his scooter with duck tape, grabbed his dirty clothes, shared a cup of coffee in the cafe, filled his meds and just sat and talked. I am his oldest and I think he just misses me sometime.When I left, he hugged me and said how much he likes my visits! He always thanks me for coming over and helping him. As I was driving back home as the day was slipping away, the 4th commandment just kept playing in my head~HONOR THY FATHER AND THY MOTHER. Ah, yes Lord, I hear you! Love ya Papa! Full moon tonight! I'm not sure if you can see it where you live as winter continues across our country this week. The clouds have parted here and there at my home in Oregon. The moon just lights up the night sky and I love it! Sometimes I don't even have to turn on the light in my bedroom. The February moon has many names, but most seem to speak winter~the sleet moon, the snow moon, the ice moon, the hunger moon, the moon when geese fly home, the crow moon and the rabbit moon to name a few. 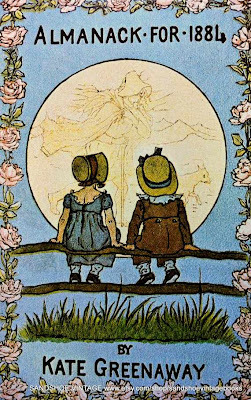 I found this very Kate Greenaway print with the full moon on Etsy. I just might have to order this! I hope you can see the beautiful full moon tonight. Gratitude Sunday #8 BUTTON BUTTON, WHO'S GOT THE BUTTON ? Button, button, who's got the button? Did you ever play that game when you were young? We did and I used to play it with the kids in my class when I taught primary grades and even at the Girls Scout Camp. It's such a simple little game, but kids love it. Almost as much as I LOVE buttons! When I was little, I would sort my mom's buttons into families, but color and size. I would spend hours sorting buttons. I still love to sort things. My Jimmy just laughs at me and tells my girls to just bring mom a bag of buttons to sort when she's in a nursing home! That will keep her busy and happy for days....I think he's right! for another Gratitude Sunday. This is her 8th Sunday, two month's worth of gratitude from us that are joining her. This is a little assortment of vintage buttons that I just can't take off of their sweet little cards. I wish things so common as a button, were packaged like they used to be. You can see some tiny buttons in this picture. I have lots of friends give me little the very small buttons for doll clothes. I am always on the hunt for those! This is how I store my buttons, the ones I may need for a craft project or quilt. I like to be able to get to them when needed. The larger box is home to the main buttons but the smaller one holds all my special and holiday buttons. I try to keep them in little containers inside the box. Oh what could be hiding inside the charming Peter Rabbit tins? More special buttons. I love all the spring and pastel ones. You may have noticed the background quilt in the pictures. My friend Linda gave it to me a few years ago. 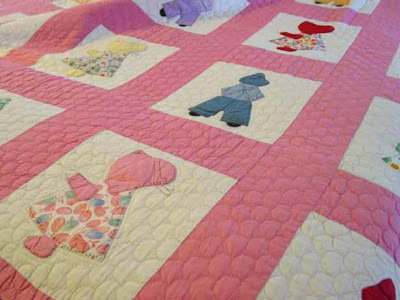 I love the embroidered quilt blocks and notice the tea time buttons in the pinwheels. This is a card of ceramic tea time buttons that I have been saving for something special. I love the flat ceramic ones for quilt projects as they are pretty flat. Did you notice this tiny box in a picture above? I love it and keep some of those tiny dolly buttons inside for safe keeping. I often go to estate sales and am a total junker. I keep my eyes open for old tins. My mother kept her buttons in a tin and I think a lot of women did. Here's a pretty tin that was loaded with treasures! I opened this little wooden box to find an assortment of mostly white and buttons made of shells, some of my favorites. Note how many in this tub were grouped together in safety pins or pieces of wire. Ladies often saved the buttons off of garments when they wore out. Thrifty homemakers. I once told my friend LaVonne (my dear friend who lives in MT that I talk about ALL the time) that I needed some more white buttons. I was also looking for a glass rolling pin. So, guess what she gifted me with....a glass rolling pin filled with white buttons of all types! I just keep filling it up when I use some for a project. Thanks LaVonne! I still love it. I'm also feeling very thankful this Sunday for my friends too who know me so well and spoil me. I have been meeting new friends this year in blogland and I have to say, I have been very touched by these new and growing friendships. It just makes me happy. So take a minute and be thankful when your button your blouse or look at that fabulous big button on your coat that just makes it fashionable! It's the little things...right? Have a wonderful week. One of the things I promised myself at New Year's was to spend some more time being creative this year! 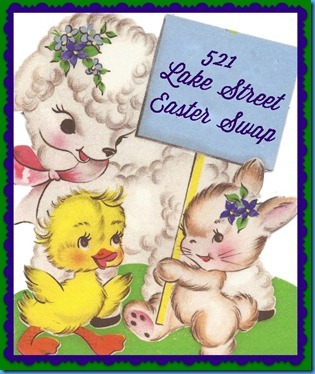 I was looking around on blogs around Valentine's and found a very fun blog...521 Lake Street. SANDY has the cutest blog so take a look. I decided to jump into the Easter Swap she was setting up for a new adventure. I am excited about it. I was partnered up with Erica at Golden Egg Vintage . Her blog is very fun too so pop over and take a look. I've been looking over her blog to get to know what she likes. Our homework is to chat with our partner and get to know her. We are to make something using a vintage wooden spool and pack it into an egg or a decorated box with extra treats included. Sounds like lots of fun to me. Of course, I am joining my Tasha Tudor group's Easter Exchange this year too! My friend LaVonne set it up and we'll be drawing names on Monday. 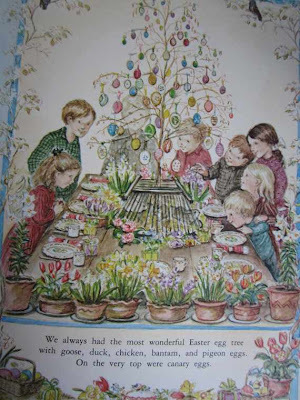 Many of us have Easter trees like Tasha had shown in the picture. I love decorating the tree with years of creations from the Tashettes. Our theme this year is Chickahominy. That was the name of Tasha's favorite rooster, so this exchange will be roosters or chicks. So you can tell I'm thinking about spring, sunshine, eggs and color! Easter is so early this year, I guess I better get decorating. Poor St Pat's get pushed aside this year. Do you enjoy decorating for the holidays? I do. It just cheers me up. Left over days from teaching and shoppes. I spent so much time on Mr Lincoln this week, so thought I'd just say Happy Birthday to our first president George Washington today! I just finished a great book that I found at the library by Stephen Berry~THE HOUSE OF ABRAHAM. It really gives the reader a great deal of information on the Lincoln family and the Todd family and how the two families interacted during the civil war years. 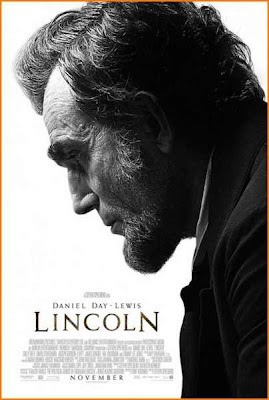 I've read many Lincoln books, but I learned so much about the families from this one. I am fascinated with Mary Todd Lincoln and I think Sally Field did a fantastic job in the movie. What a wonderful role to play at this point in her career. I saw several interviews on how she really went all out to get the part. On our last visit to the Lincoln Museum in Springfield, Illinois, I bought this little ornament. It's a copy of the Lincoln's presidential china. I really wanted to buy a cup and saucer but it was a bit out of my budget. 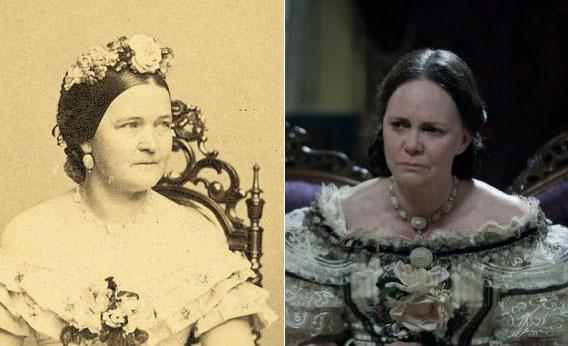 When the Lincolns went to the White House in 1861, Mary was upset with the china that was available for entertaining. We all know how she loved to entertain, so she worked with the EV Haughwout & CO of New York, to design a presidential china. She chose Haviland of France to help her. She wanted a white center with a scalloped border. The handpainted purple border was known as ROYAL PURPLE and she chose a rope border to go with the purple border. The center was to have the American Eagle in the clouds. Of course, he was to have the arrows and the olive branch in his talons. 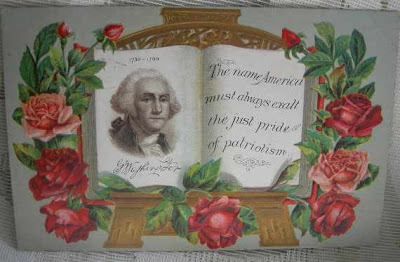 The motto "E Pluribus Unum" was to be added. After Christmas, I decided to order that cup and saucer after a great Etsy season! As I was looking online for one, I discovered that the Wooodmere Company of Pennsylvania has discontinued their production of their version of the Royal Purple Lincoln china! Some museums had already sold out. I found that Replacements carried the cup and saucer so I ordered it from them. It arrived in a nice blue box. Isn't it just beautiful! It also goes with the burgundy cup and saucers that I've been collecting~perfect for Tea Time Thursday. It came with an official "Certificate of Authenticity"! Classy! I've been using some music pages as a background for my photos. I found a great book at an Estate sale about Civil War songs. I found it interesting and love the graphics. This is some wonderful Civil War music that I purchased at the Lincoln Presidential Library and Museum. It's a two disc set with lots of great music....very enjoyable. I recently picked up this little interesting book at a flea market. I'm always on the hunt! LaVonne in MT sent my Annabelle these treats for Valentine's Day. Can you believe she found two little miniature books on Lincoln? Amazing! Last March when we were in Montana, I found these two oversized postcards...wonderful! I saved all these Lincoln things for Tea Time Thursday as close to President's Day as I could get! I felt sorry for old George, so I did buy this sweet little dish with his image in the center. Happy President's Day week! July 25th...On His Due Date! The Newest addition to the clan! "Pleasant words are like a honeycomb, sweet to the soul and healing to the bones." Proverbs 16:24 Welcome to my dream~my own little blog.I now have a place to share the many blessings God has showered on me and a way to record my journey through life. My cozy home can be found in the beautiful Northwest. My husband and I have enjoyed 40+ years of marriage along with two wonderful grown daughters. My baby Gina lives in WA and teaches at Everette Community College. We hope she will be moving back to Oregon soon. My oldest Angie is married to Chris who has a little girl. They had a baby boy on July 25, 2013 and he is just the cutest little guy ever! We love being grandparents. Jim and I are enjoying our retirement! We are blessed with a busy and fun life. 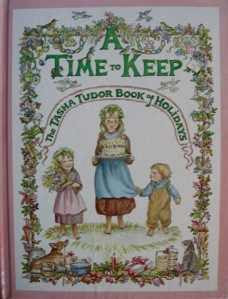 Oh, time for tea,a Tahsa Tudor book,quilting,gardening, friends or maybe a new craft! Don't forget a good Estate Sale looking for treasures for Jim's antique shows or my Etsy shoppe. Sign of the times - This always makes me laugh. If you are heading that way, enjoy! Newest Dolly to Join the Gang! Teacup Thursday #76 and Gifts from MT! Valentine Blessings! SO Many Cards and Treats!